Every semester in the Mentoring/BSLS program, we create teams of students with similar majors. While mixing together underclassmen and upperclassmen, this is a great opportunity for students to connect with each other, get advice, and meet other friends in their major. This year for mentoring we are introducing a new position called “family head” this person will be in charge of creating a communication system for their family. 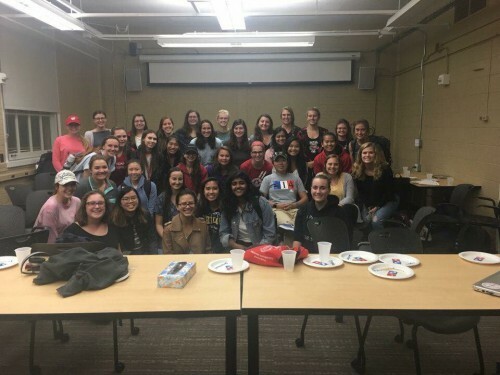 Additionally they will plan events for their family, such as study nights, dinners or attending other SWE events. If you are interested in participating in SWE Mentoring Committee, please contact either Heather Huna at huna@wisc.edu or Lisa Krzyzanowski at lkrzyzanowsk@wisc.edu. Meet the 2018-19 Mentoring Co-Chairs! My name is Lisa Krzyzanowski and I am a 5th year senior studying Chemical Engineering. I am from Waukesha, WI. My first experience with SWE was as a senior in High School when I attended Day on Campus. It was an amazing experience that helped me learn that I was meant to join SWE. Hello! My name is Heather Huna and I am a senior studying Mechanical Engineering. Outside of school and SWE, I love to draw and paint. I’m also a huge coffee fan and am always up for getting a cup of coffee. This is my second officer position with SWE and I am very excited for all the fun events Lisa and I have planned for Mentoring Committee this semester! A look back at last years mentoring events! There were 85 SWE members who participated in the Mentoring Committee’s Big Sib Little Sib (BSLS) program. We held multiple study nights to provide a relaxed setting for the members to get to know each other better and receive help with classes.